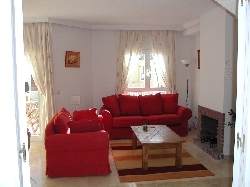 This is a lovely modern, bright, air conditioned townhouse on a small secure gated development, adjacent to Duquesa golf course and can sleep up to six persons. The house is furnished to an extremely high standard and which comprises main double bedroom with en-suite and two twin bedrooms with adjacent bathroom/shower. Main bedroom has door leading to private balcony.The ground floor consists of a large lounge/dining room with Sky TV, DVD, Playstation 2 and CD radio/cassette player. There is a separate fully fitted modern kitchen with electric hob/oven, microwave, fridge/freezer and dishwasher plus a full compliment of utensils. There is also a downstairs toilet and washbasin. A washing machine is located in a separately enclosed utility room. At the rear is a private patio area and garden fully equipped with sun loungers,table and chairs and an integral BBQ. The communal swimming pool, equipped with sun loungers, showers and integral toilet facilities is within 50 metres distance of the house.The beaches, restaurants, bars and Duquesa Marina are but a 5 minute drive away. Nearby is Duquesa Golf & Country Club with its own gym, pool, tennis courts, restaurant and bar(5 mins walk).Castillo and Duquesa old village with beaches, bars and restaurants ( 10 mins walk). Duquesa Marina with its large variety of restaurants, bars, cafes and shops (5 mins drive). 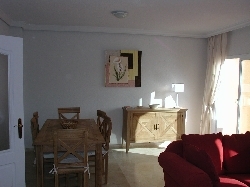 Estepona with stylish promenades, beaches and own port/marina ( 10 minute drive). Marbella, Puerto Banus and Gibralter with their vast variety of restaurants, bars and superstore shopping are just a 20 minute drive away.Airports for Duquesa are Gibraltar (20mins drive), Malaga (50 mins drive) and Jerez (75 min drive) and all served by the major low cost airlines.